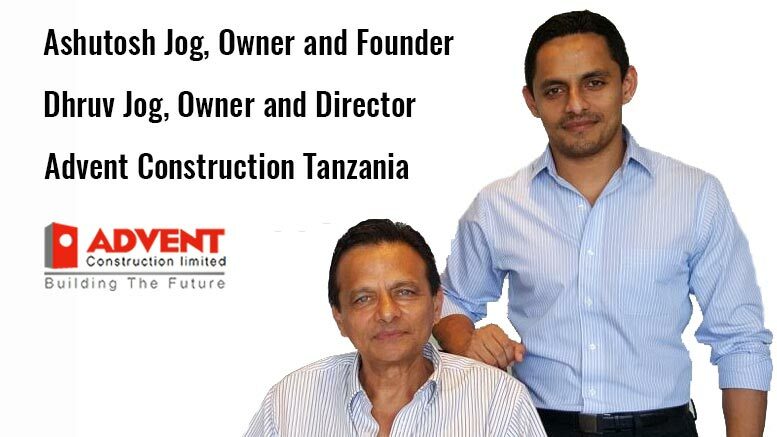 TanzaniaInvest had the pleasure to meet Ashutosh Jog, Owner and Founder, and Dhruv Jog, Owner and Director of Advent Construction, one of Tanzania’s largest civil and building construction companies. Dhruv Jog discusses the opportunities in real estate in the country and the outlook of the construction sector. TanzaniaInvest (TI): The value of the construction industry in Tanzania was USD6b in 2015, compared to only USD1.6b in 2010, representing a growth of 275%. Is such intense growth sustainable in the future? Dhruv Jog (DJ): 2016 has seen fewer projects being launched as compared to previous years due to a realignment of the industry and key sectors of development being adjusted to better suit the long-term strategic objectives of Tanzania as a whole and the demand drivers in the construction sector in particular. However, this realignment will result in the value of Tanzania’s construction industry increasing substantially in 2017 and beyond to much higher levels and unprecedented growth. The growth achieved so far will certainly be eclipsed by several multiples in the next year and at least in the next two decades, given that the current environment is better suited for the long-term strategic objectives and requirements of Tanzania as a growing economy, in order to achieve our national objective of being a middle-income economy by 2025. TI: With a population of about 52m and growing, Tanzania has a housing shortage of 3m houses. In which segment do you see the most interesting opportunities? DJ: Currently, the most interesting opportunities lie within the middle and lower middle sectors of housing to cater for the rapidly emerging middle class and the immense influx of Tanzanians into urban environments. However, the two primary challenges we face that hampers the development of these sectors of housing are infrastructure to cater to these housing projects and high costs of borrowing that discourage the mortgage product from kick-starting our housing market. Any mid-market housing development project that addresses these obstacles in the form of providing internal infrastructural requirements by developing satellite cities or similar models and providing access to subsidized housing funding would be immensely successful. TI: You are involved in the construction of the Peninsula Plaza Shopping Mall in Dar es Salaam, which is set to be the largest mall in Tanzania. What is the timeframe for completing this project and what will be the offering? DJ: Peninsula plaza is slated to be Tanzania’s largest shopping center and one of the largest in the region. When it will be completed, within 30 months of commencement construction, it will introduce global brand leaders in the retail, wholesale and entertainment sectors as well as a state of the art office complex. The project meets international standards of design, health and safety and security while incorporating the most modern technology to be energy efficient. What are the other most exciting projects you are currently working on in Tanzania? We are working on several extremely interesting projects at the moment which include high end hospitality sector developments as well as industrial developments like cement factories and marine facilities. We also have several extremely interesting and large projects that will have a major impact on our country’s overall offerings in the global market that are slated to break ground in the first quarter of 2017. Infrastructural developments and large civil and Industrial projects are currently heavily present on our order book and projects pipeline and we are extremely excited about the coming two decades. TI: What is your development strategy for the years ahead and what are the main challenges you are facing? DJ: We have a strategic 10-year plan that focuses on our core competencies. Being one of Tanzania’s largest and fully local civil and building construction companies, we want to participate in the success of major projects that require local execution teams. As with any growing economy, we face certain challenges such as access to highly technically skilled human capital and financial resources coupled with experience in large infrastructure development projects. However, our strategic international alliances allow us to overcome these challenges relatively easy. TI: Are there opportunities for partnership with Advent Construction in Tanzania and what are the advantages of doing so? DJ: By partnering with Advent, you align yourself with a 22 year old company that is built on the foundations of reliability, integrity and the highest quality of construction in the country and is known nationwide for these values. Advent is the first ISO certified construction company in Tanzania and is one of the few companies in the country that meets the demanding standards of the oil and gas industry. We also meet the global standards of construction, health, safety and transparency. Given that local construction companies are required to be part of every major construction project slated to be executed here onwards in Tanzania, we boost key advantages for tier one international partners looking to form strategic alliances in Tanzania. TI: To conclude, why invest in Tanzania and why in real estate? DJ: Tanzania is one of the fastest growing countries in the world and boasts a large population that is rapidly growing and an economy that is becoming stronger by the day. Tanzania is already a regional favorite for FDI, given its political stability, regionally strategic location and the business incentives offered. The new government determined to create a conducive business environment for multinationals to enter the market and be a part of our growth and flourish in the process. Given that our large population continues to grow rapidly, real estate will certainly be a key part of our national growth and is certainly a very interesting sector to invest in.